Fun Friday Finds: Hot Enough! Of course we are all familiar with the old adage that March comes in like a lion and goes out like a lamb. But what about August? This year, anyway, here in Minnesota -- up north they've got raging thunderstorms, and in the Twin Cities we've got 95 degrees and dripping dew points! It seems to me that August arrived in Minnesota like a fresh water trout swimming happily in a cool clear stream, and it's going out like a fire-breathing dragon! 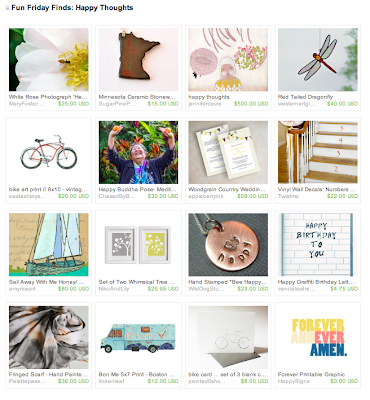 Well, it will all soon be over, so why not celebrate the fiery final days of summer with some red hot finds from Minnesota artists on Etsy. This week's giveaway is from Audrey and Jonny of Key Candles. They are giving away this beeswax pillar candle. This candle is made from 100% beeswax and zinc-free cotton wick. Audrey and Jonny use beeswax from a local apiary in Southern Minnesota that has a lovely sweet scent and a rich golden color. This candle is 3 inches in diameter and 6 inches tall. The candle should be burned for several hours at a time on a non-combustible plate. This is Key Candle's largest cylindrical pillar candle and its size makes it an eye-catching piece. Contest ends Saturday, September 7th, at 12:00 noon Central. One winner will be chosen by Random.org. 7. 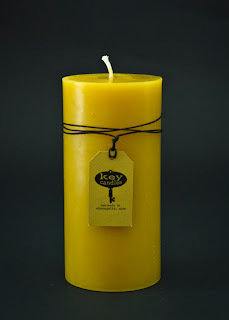 Become a Facebook Fan of Key Candles. Comment back here with your Facebook name. Existing fans just leave your Facebook name here. 8. Follow Key Candle's blog. Leave a comment here letting us know you are a follower. If you are already a follower, leave a comment anyway, as each comment is an entry. 9. Follow Key Candles on Pinterest. Comment back here letting us know you are a follower. This week's giveaway is from Amy of LyricCol Design and she is giving away a beautiful pair of Swarovski crystal earrings. Amy was inspired to create these beautiful earrings by her parents retro-style bathroom. 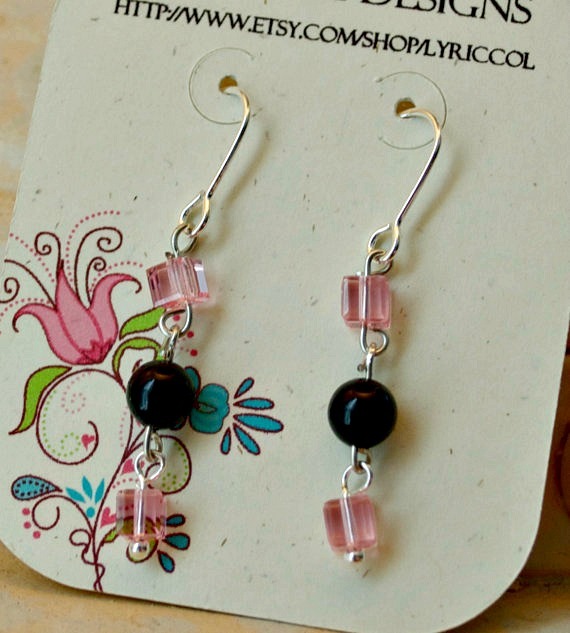 Their bathroom has gorgeous vintage pink and black subway tiles and these dangle earrings are fashioned with pink crystal beads by Swarovski and silver wire. They will be a fun and classy addition to your wardrobe. Open to US Canada residents. Visit LyricCol Design, pick your favorite item and leave a comment on this post about it. (Scroll to bottom of post and click on Comments) Please make sure you include your email address so we have a way to contact the winner! 7. Become a Facebook Fan of LyricCol Design. Comment back here with your Facebook name. Existing fans just leave your Facebook name here. 8. Follow LyricCol Design on twitter. Comment back here with your Twitter link. Existing followers just leave your Twitter link here. Contest ends Saturday, August 31st, at 12:00 noon Central. One winner will be chosen by Random.org. This week's giveaway is from Kelly Newcomer Drawings & Paintings. 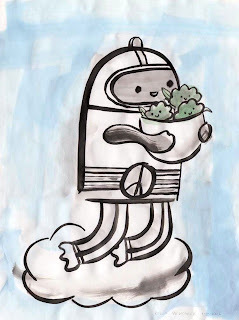 She is giving away this adorable signed & dated ORIGINAL painting! Kelly's Peace Machine floats in the sky on a cloud, hugging a bowl with cute little broccoli plants. This is really an original painting she's giving away, folks! Kelly uses Sumi ink and watercolor on Sumi paper. The paper is slightly textured and doesn't lie flat, but that is part of the charm of this original 9" x 12" painting. Sumi is a Japanese method and the ink soaks through. Each brushstroke shows and the work has to be completed in one go, there are no re-worked areas. Contest ends Saturday, August 24th, at 12:00 noon Central. One winner will be chosen by Random.org. 7. Become a Facebook Fan of Kelly Newcomer Drawings & Paintings. Comment back here with your Facebook name. Existing fans just leave your Facebook name here. 8. Follow Kelly Newcomer Drawings & Paintings on Twitter. Comment back here with your Twitter link. Existing followers just leave your Twitter link here. 9. Follow Kelly's blog. Leave a comment here letting us know you are a follower. If you are already a follower, leave a comment anyway, as each comment is an entry. 10. Follow Kelly on Pinterest. Comment back here letting us know you are a follower. 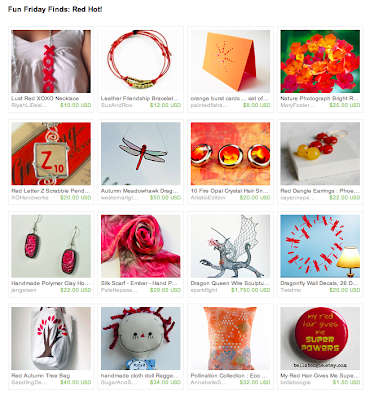 Sometimes an object becomes the inspiration for a whole composition, and that can happen on Etsy, too, when a clever title on an appealing work suggests itself as a theme for a collection (aka "treasury"). So it was when I came across Jennifer Davis's work, "Happy Thoughts," shown at left. From that beginning, I gathered a collection of items on Etsy made by Minnesota artists and crafters that I thought related to this work--either its sentiment or its appearance. The result is the following collection of cheerful items, mostly incorporating the pastel palette that is characteristic of this artist. This week's giveaway is from Desi of Sugar Pine Pottery and she is giving away a beautiful pair of ceramic earrings. Desi creates functional ceramics, such as mugs, tableware, ornaments and unique jewelry using stoneware clay and fired in a reduction atmosphere causing beautiful variations in the surface of each piece. She created these beautiful handmade ceramic earrings using stoneware with ochre, and then glazed with Tomato Red. The textured clay gives these earrings a unique appearance. The copper ear wires are the perfect complement to the rustic stoneware and are 3.75 cm in length. The earrings are earthy and elegant. Her unique earrings are sure to draw attention as well compliments. Visit Sugar Pine Pottery, pick your favorite item and leave a comment on this post about it. (Scroll to bottom of post and click on Comments) Please make sure you include your email address so we have a way to contact the winner! 7. 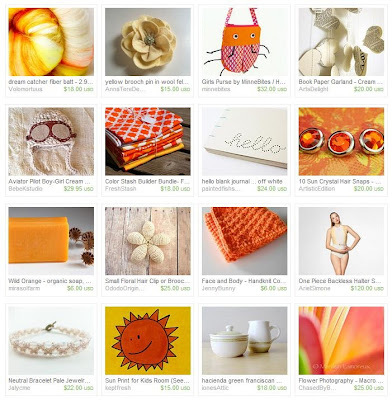 Become a Facebook Fan of Sugar Pine Pottery. Comment back here with your Facebook name. Existing fans just leave your Facebook name here. Contest ends Saturday, August 17th, at 12:00 noon Central. One winner will be chosen by Random.org. 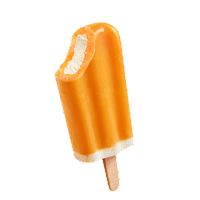 kind of girl but sometimes I just can't resist the cool and creamy summer treat called a Creamsicle® or dreamsicle. The classic creamsicle is a frozen dessert with a vanilla ice cream core with an orange sherbet coating. There are many other variations of the dreamsicle, such as cakes, drinks, shots, cupcakes and of course these dreamy orange and cream finds from Minnesota!